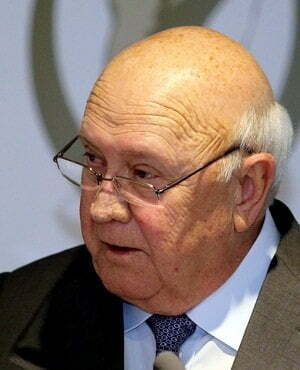 Should the City of Cape Town rename a street after FW de Klerk? If you’re too busy to read the full post, my answer (as per Betteridge’s Law) is “no”. From today and until the end of October, the public have been invited to participate in the City of Cape Town’s deliberations on whether to rename Table Bay Boulevard in honour of FW – so, it would become FW de Klerk Boulevard. If you want to read the full request for input, it’s on the City’s “Have your say” website, along with a fillable form. You could also email [email protected] (or submit something by fax, and therefore presumably by carrier pigeon also). The proposal for renaming Table Bay Boulevard (the first section of N1 from Cape Town), FW De Klerk Boulevard, is motivated by the role that Mr. De Klerk played in the transition to a new dispensation in South Africa. He is a Nobel Peace Laureate recipient who has not received any recognition for the role he has played in the recent history of South Africa. “He is a Nobel Peace Laureate who has not received any recognition“? I’m guessing they left something out there, like “not received any recognition in the form of a road being named after him”. And it’s not just the Nobel that he’s been awarded: there’s the Prix du Courage Internationale, the UNESCO Houphouet-Boigny Prize, the Prince of Asturias Prize, and the Philadelphia Peace Prize. On top of those (and others I haven’t listed), I’ve found reference to 8 Honorary Doctorates, and then the Order of Mapungubwe (Gold) – South Africa’s highest honour – too. So, it’s really only the City of Cape Town who seem to have forgotten to give this man a token of their appreciation. Here’s why this Capetonian (me) thinks that they should keep on forgetting to do so, and why I’d encourage you to express your disapproval of the plan too (assuming you do disapprove, of course). First, an objection in principle: it’s irrational to name things after living people in general, especially when naming and renaming costs money. If you don’t already think FW de Klerk unworthy of having a road named after him, he’s still got time to demonstrate his unworthiness to you. I have no reason to expect that we’re going to learn unsavoury things about him in his remaining years, but it’s certainly possible – so I’d at least want to wait until his full story has been written, in case we end up naming a road after someone who has been exposed as a [insert something unsavoury here]. And second, because it was always absurd that he was awarded the Nobel alongside Mandela. Sure, the 10%-ish percent of white South Africans had a disproportionate number of guns and Rands, so were perhaps taken more seriously than they might otherwise have been, but any of you who were in South Africa in the late 80’s would know that FW had two choices: blood in the streets, or handing power over. You don’t get to play at magnanimity if you never deserved to be the boss, and also, it’s no great achievement to do what anyone in your position would have needed to do, in order to avoid further bombings, murders, international ostracisation and the like. I’d perhaps feel differently about de Klerk if he had a history of being a democrat, and someone committed to a non-racial South Africa. But he was the leader of the National Party in our most conservative Province, the Transvaal, and served a succession of racist white Presidents loyally. As Minister of Education, he supported the continued racial segregation of our universities. Black Africans had basically lost nearly all of their human rights over that period [the second half of the 20th century]. Nothing in De Klerk’s Afrikaner background suggested he was about to reverse all that. He had been in the job just four months and was still an unknown quantity, but what was known about him suggested he was no reformer. After a lifetime in the National Party (he was 54), he was generally regarded as on the verkrampte, or unenlightened, side of the party, although he always saw himself around the middle, neither verkrampte or verligte (enlightened), but certainly conservative. He’s not a great man. He’s a man who was in charge at a great moment in history. It would have made some sense to honour him at the time, as one of those reconciliation gestures South Africans seem to be fond of. But in de Klerk’s case, we’ve done that already, and there’s no constituency (that I’m aware of, at least) that’s clamouring for de Klerk to be given any more medals or prizes. On the other hand, there are still scores of less celebrated but important South Africans who haven’t yet had a road named after them, never mind being awarded honorary doctorates or Nobel Peace Prizes. You’d think we’ve simply run out of ideas, in proposing to name a road after de Klerk. But sadly, this might be another indication of Cape Town, the Western Cape, and (by extension) the DA’s obliviousness to aspects of political messaging. When you’re constantly criticised (often unfairly) for being a racist City, renaming prominent roads offers an opportunity to subtly shift the character and reputation of the City either closer to or further from those perceptions. Why choose the former?